A Year of Being Here: David Wagoner: "Old Man, Old Man"
David Wagoner: "Old Man, Old Man"
To this Old Man. Old Man, they say, where should we go? Where did you find what you remember? Was it perched in a tree? If our mouths have long lain empty? All night, and turn the color of earth? If we lie down in the rain, can we remember sunlight? He answers, I have become the best and worst I dreamed. When I move my feet, the ground moves under them. When I lie down, I fit the earth too well. Will ring when you strike them. Or break in two. Now the places themselves have come in close to be told. Every secret is as near as your fingers. Bend forward over it like a man at a small campfire. "Old Man, Old Man" by David Wagoner, from Traveling Light: Collected and New Poems. © Illinois Poetry Series, 1999. 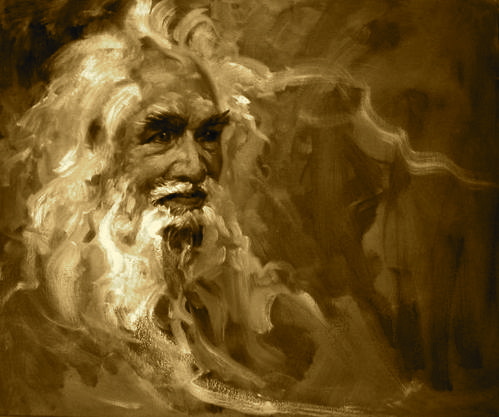 Image credit: "Wise Old Man," painting by Andrew Judd (originally color). Where did this vision of an old man come from. Wonderful. Simple while mysterious, subtle while leaving alone. e. e. cummings: "let it go—the"
Ellen Bass: "If You Knew"
Philip Booth: "Talk about Walking"
Jalal ad-Din Muhammad Rumi: "That Lives in Us"
Ruby R. Wilson: "Birthday Sunrise"
Dorothy Walters: "Don't Make Lists"
Jimmy Santiago Baca: "This Day"
Arnoldo Garcia: "A Meditation on Breath"
Anonymous: "Samurai Song, 14th Century"
Jason Shinder: "Alone for the Fifth Day"
Sharon Olds: "Looking at Them Asleep"
Denise Levertov: "Looking, Walking, Being"
Rachel Contreni Flynn: "The Yellow Bowl"
James Broughton: "Take the Whole Kit"